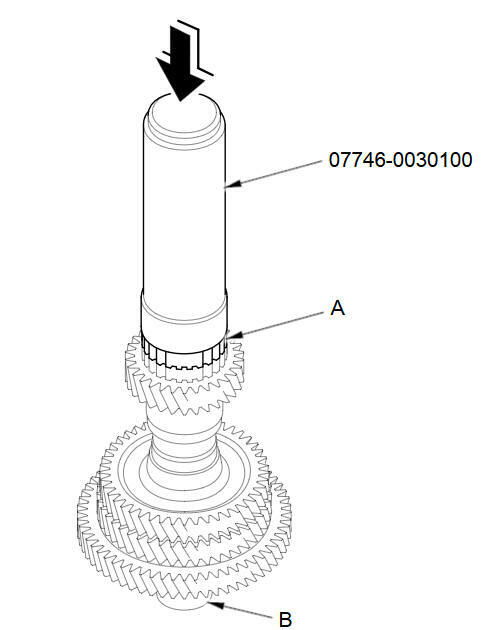 Install 1st gear, 2nd gear, 3rd gear, the 33.2 x 40 x 26 mm collar, the 29 mm cotters, and the 33 x 45 x 7.8 mm collar on the countershaft, and secure them with the snap ring. Install the needle bearings and the 4th-5th gear. Slide the reverse selector hub (A) over the countershaft (B), then press it in place using the driver handle (40 mm I.D.) and a press. NOTE: Some reverse selector hubs are not press-fitted, and can be installed without using the a press.